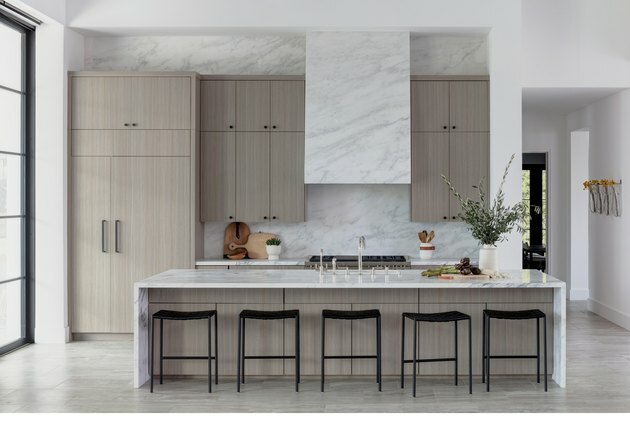 It's easy to see why marble kitchen backsplashes are a design "do" for so many designers: marble is the little black dress of the design world. It's a versatile material that, depending on what it's paired with, can go glam, modern, traditional, even rustic. 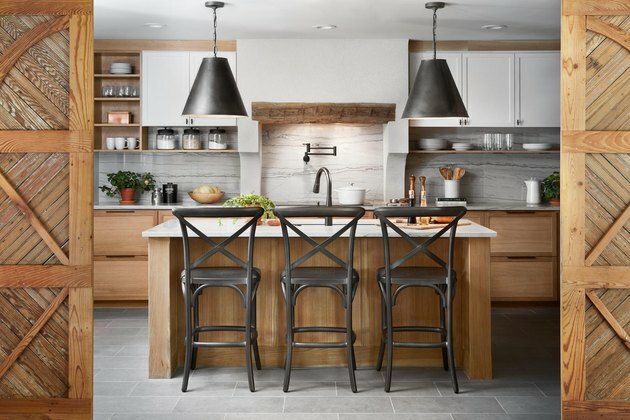 Yet, as is often the case, beauty comes at a price, especially if you are looking at purchasing large slabs for a kitchen remodel. However, cost-conscious renovators fear not — marble tiles are a budget-friendly option, and they're equally lovely. 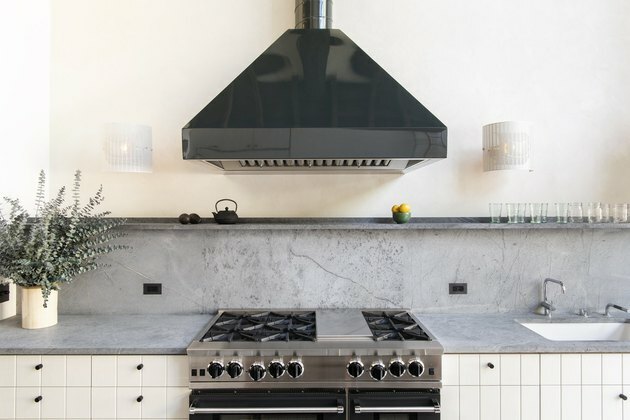 Here are 12 marble backsplash ideas for your consideration. Yes, there's a lot going on here, but London-based DeVOL kitchens pulls it off perfectly, and we wouldn't expect anything less from them. They go all-in with bold hunter green cabinets and walls, brass hardware, and statement-making marble that is tempered by old-world fixtures and artwork. Bravo. 2. Commit to a color. 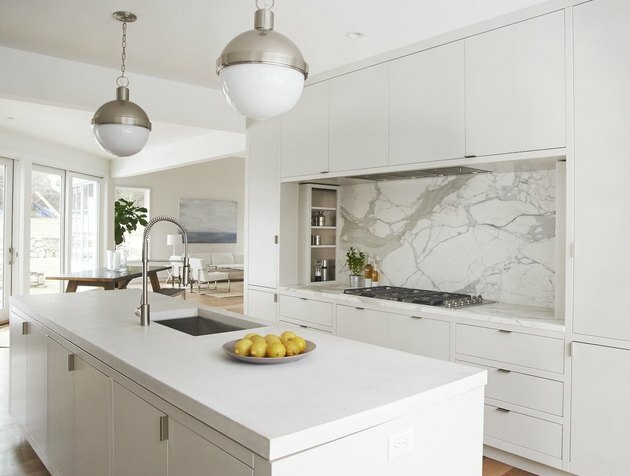 Sarah Sherman Samuel selected green tweed marble to elevate an all-white kitchen remodel in her client's residence. 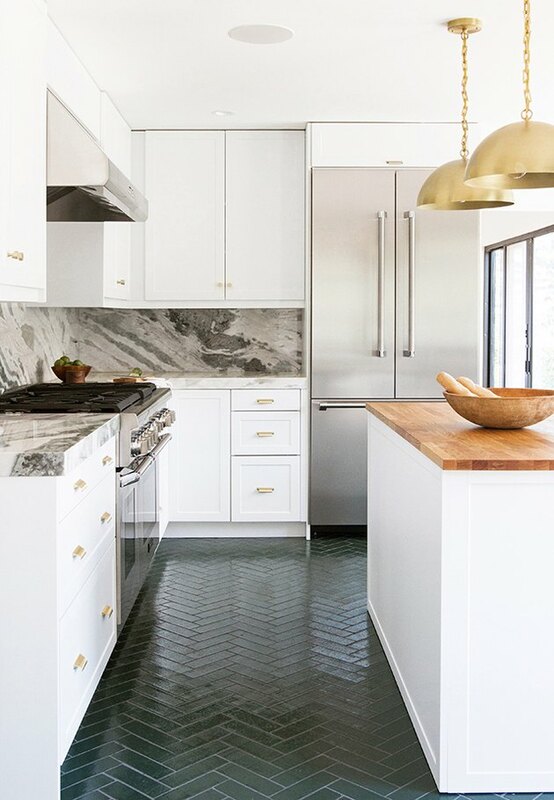 We love how the green herringbone tile floor makes the space even more unique and echoes the marble hue. A butcher block island and gold pendant lights warm up the room. 3. Take it all the way to the top. We are so not mad at this understated and perfectly executed kitchen by Studio Lifestyle. Sometimes more really is ... more. Calcutta countertops seamlessly transition into a ceiling-height backsplash and hood. 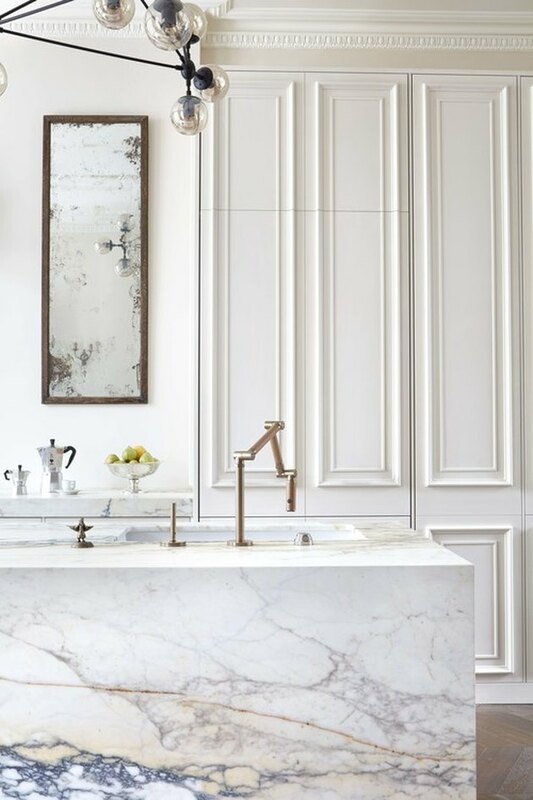 The muted cabinet color and lack of pendant lights ensures that the marble will be the conversation piece in this beauty. Forgo upper cabinets and add a diminutive shelf for displaying everyday items like Elizabeth Roberts did in this Cobble Hill remodel. Gray countertops and backsplash, paired with warm white, slatted wood lower cabinets and almost-not-there hardware, create a Scandi/minimalist vibe we never tire of. 5. Try traditional with a twist. Marble subway tile applied in a traditional off-set pattern is a great, cost-effective alternative to marble slabs. This look by Studio McGee is still glamorous, yet slightly more industrial. Brass wall-mounted lights, white Tolix stools, and open wood shelves add a bit of rustic charm. Consider creating a luxe marble alcove that hugs your stove. Calla Studio chose flat-front cabinetry, slim hardware, and simple lighting to make sure that the marble was the main attraction. 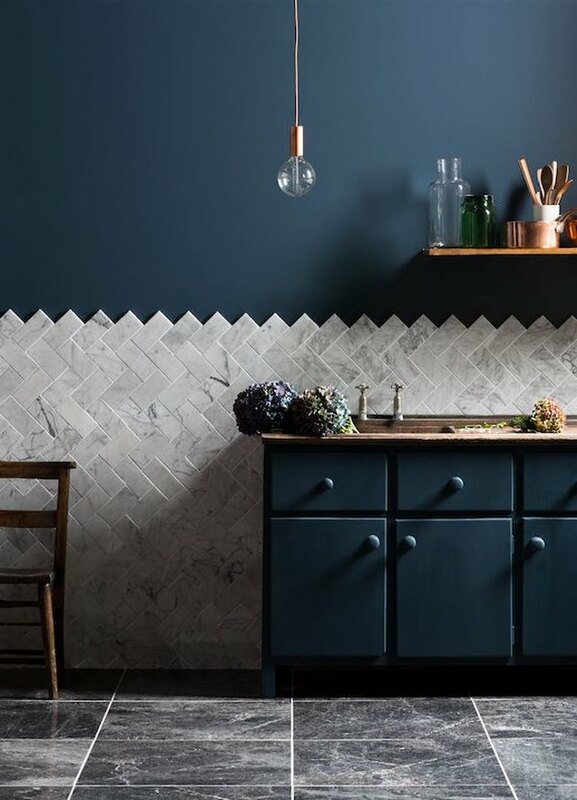 Create texture and subtle pattern by applying marble subway tiles in a vertical herringbone pattern as your backsplash. Mandarin Stone styled it so the natural edges of the tile become the focal point, and also functions as an eye-catching decorative detail. 8. Go for the gold. 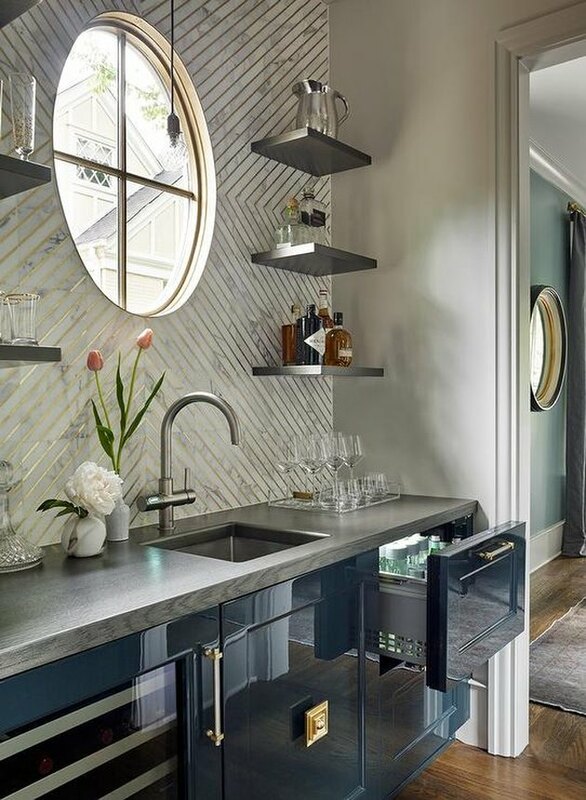 Why not guild the marble lily and add gold chevron stripes to your backsplash like Matthew Quinn did in this wet bar? The lacquered blue cabinets, grey countertop, and metal shelves amp up the glam factor even further. 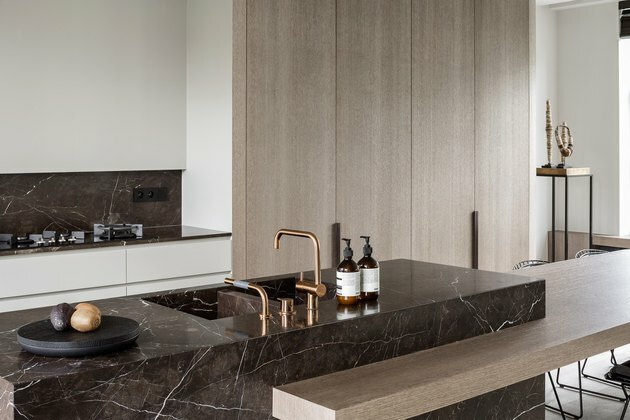 A darker marble like this option by Juma Architects imparts a masculine and moody vibe that we love. The white paint pulls out the light veining while the light wood warms it up. Gold taps complement the look perfectly. Mix marble as Nicole Hollis did in this San Francisco stunner. 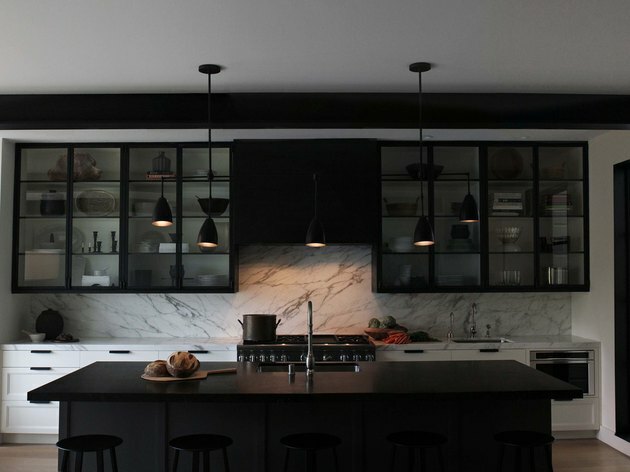 A black marble-topped island is the yin to the yang of white marble countertops and backsplash. 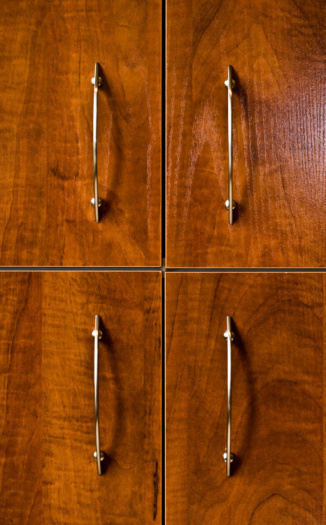 The shaker style bottom cabinets and glass-front uppers soften the masculine tone. 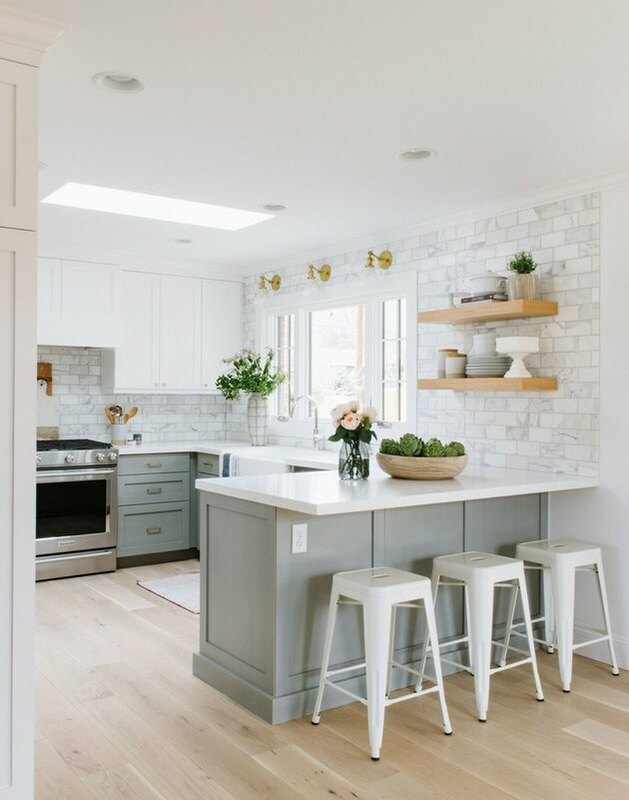 There may be a lot of warm, natural wood elements in this kitchen by Joanna Gaines, but the beautiful marble backsplash keeps the look sophisticated. What's that you say? Don't use a backsplash? Yes, it's unconventional, but you came here looking for ideas. 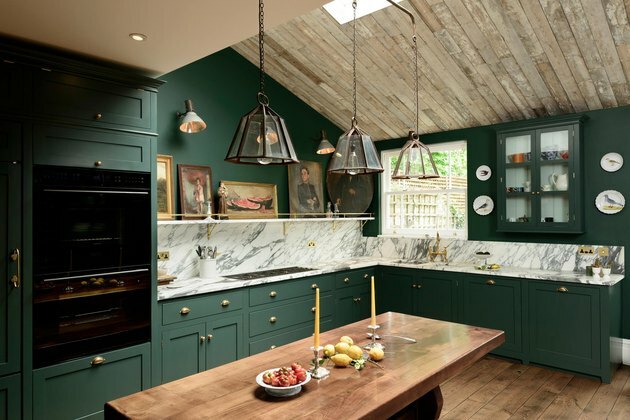 Taking a cue from this swoon-worthy kitchen by Blakes London, we are on board with skipping a backsplash altogether. Pulling this off calls for extra thick marble countertops and an island that anchors the space in size and beauty (let's just pause another moment and take in that color). Note: If going this route, avoid matte paint on the walls, which is more difficult to clean.